Sweet Easter basket design food flags, stickers or cupcake topper toothpick flags. Print a sheet and cut out using scissors, craft knife or a standard papercrafts punch. Glue or tape to toothpick, drinking straw, coffee stir stick, or lolly stick. Attach each topper to a toothpick, short drinking straw or coffee stir stick. 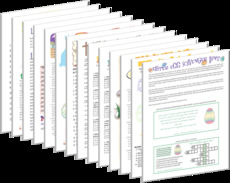 This printable topper sheets can also be used to make Easter stickers or gift tags! Simply print on self adhesive paper and cut out or print and stick on using glue stick or home made stamp glue. Baby Animals Cupcake Toppers Printable Sheet - Adobe PDF, 8.5" x 11" contains 12 stickers or cupcake toppers as shown above. Cut into squares or circles as desired. You might also like our printable Easter basket design stickers / cupcake topper food flags (sample shown below). Each sheet contains 12 stickers of this same design.